You’re about to select a push notification service provider. Before you make a decision, I’d like to make the point that not all of these tools are created equal. In the next few minutes, I’ll give you my own personal checklist for ticking off all the requirements that you need to know when choosing a push notification provider. You hear, time and time again, it’s all about the personalization. When it comes to push notifications and selecting a provider, make sure, first of all, that you can bring in data from external CRMs. This does not only mean the first name, but other different personalization variables and make sure that you can inject these into the actual push notification text as well. Many push tools currently on the market allow you to send a high volume of push notifications, but they do this at the sacrifice of personalization. They don’t allow you to inject the person’s first name, or they don’t allow you to change the push notification text in any way. 2. CAN THEY SUPPORT YOUR VOLUME? Make sure that your provider supports a very high throughput of push notifications and that they can get up to a very high volume across different platforms. For instance at Pulsate, for any individual client, we can do a million push notifications per 30 seconds without sacrificing the personalization. Yes, you can bring in your merge tags, and dial up the throttle to max, and send millions of notifications at a time. These are great for alerts but probably you don’t want to use them when you want to segment your audience or you want to do Geo-location alerts. If you want send breaking news to everybody you will have to have a provider that can support this volume. 3. IS THEIR PUSH INTERACTIVE? In my previous episode what are push notifications, we spoke about interactive push. Sometimes you want to allow a customer to interact directly from the push notification without having to open up your app. They don’t just want to get a static notification with a few emojis. You want them to say yea or nay to the event you’ve invited them to, you want to ask them do they like x or y, or do they want to click and collect or order something in time for lunch. Interactive push allows you to do this. Again, this will be a big thing that you need to tick off to make sure your provider does this. Localization is the next point. Pulsate is one of the few tools that allows you to send out in hundreds of languages if you need to. By sending notifications in the local language setting of that device is really going to boost not only your open rates, but your conversion rates later in the funnel as well. 5. DOES YOUR PUSH NOTIFICATION SERVICE PROVIDER ALLOW A/B TESTING? Multivariate testing is typically a big requirement by marketing teams . Check that your provider allows you to send more than one version. 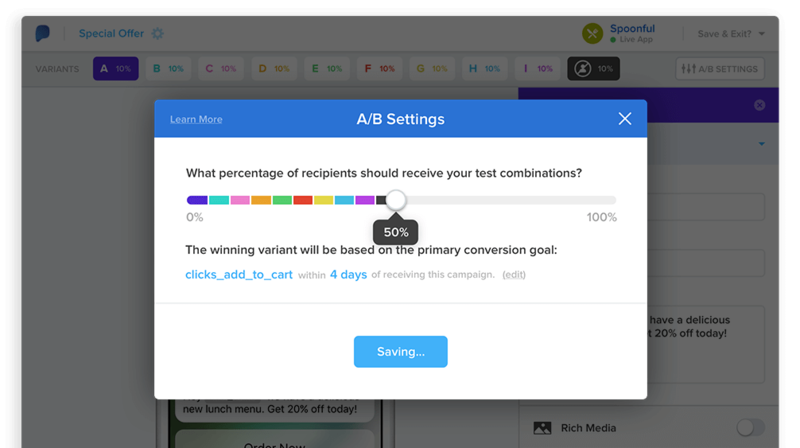 Being able to send an A/B split test for push notifications, or even better, again, a full multivariate where you can do as much as maybe 10 different versions of the push will provide better insights into the performance of push notifications. Bonus points is if the system can automatically select a winner based on looking at the performance of the splits, and send to the remaining cohort of users the best performing push after a period of time. 6. ARE YOU INTELLIGENT WITH YOUR TARGETING? Next up, intelligent targeting. Yes, you need to be able to send the volume and do personalization, but all this is useless unless you can actually select the group of people that you want to get the push notification. Make sure there’s really good segmentation (bonus points if it’s real-time segmentation) and also that location targeting and some kind of event level targeting is included in the solution. You want very good granular controls around the delivery schedule, maybe certain days of the week, maybe certain times of the day, and also don’t forget about recurrences of the campaign, frequency and recency, capping the label for it. All these features are really, really important. You may want to send a campaign at the local time of a user. If users are travelling and suddenly they’re in a different country, a different time zone, and they’re getting your push notifications in the middle of the night and they’re being woken up, your app is not so popular! Your app is a prime candidate for “Uninstall.” A feature such as this will allow you to only send that notification at that time, in the user’s local time zone. Bonus points, for intelligent targeting where it’s not about time zone, but by looking at when the users use your app and when they’ve opened your previous campaigns, picking an individual time to send for each individual user. This is kind of moving into the realms of machine learning and predictive analytics, but a great feature if it comes built into a platform. In-app Notifications. 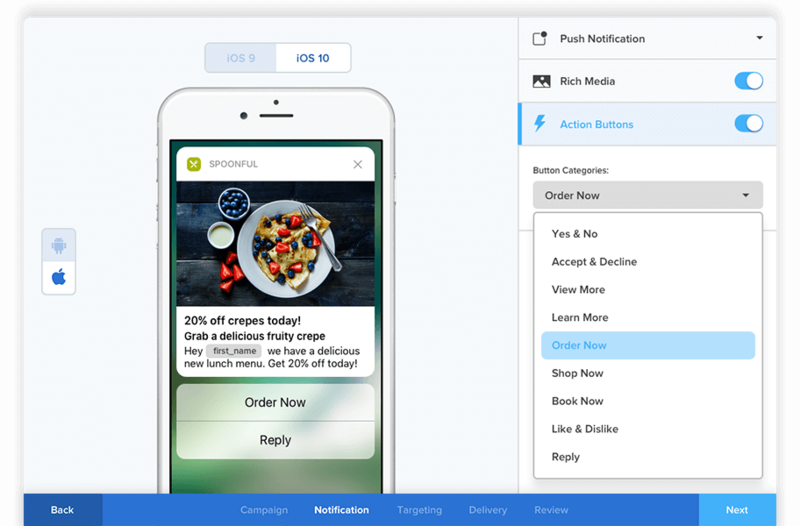 It’s kind of a little bit separate from push notifications but having an option within your app to grab users’ attention while you already have it can be a great feature to use alongside push notifications, which can really complement each other. 10. HOW RICH IS YOUR MEDIA BUILDER? If a rich media builder comes with your push notification service provider, then great. It’s one thing to allow your push notifications to be deep-linked to a screen within your app, but then, for every campaign, you’ve got to build these screens one by one. If you have a rich media builder, it means you can create campaigns in minutes using drag-and-drop features to add and images and text. You build the experience, and then the SDK takes the information and renders this rich campaign when they open the push. 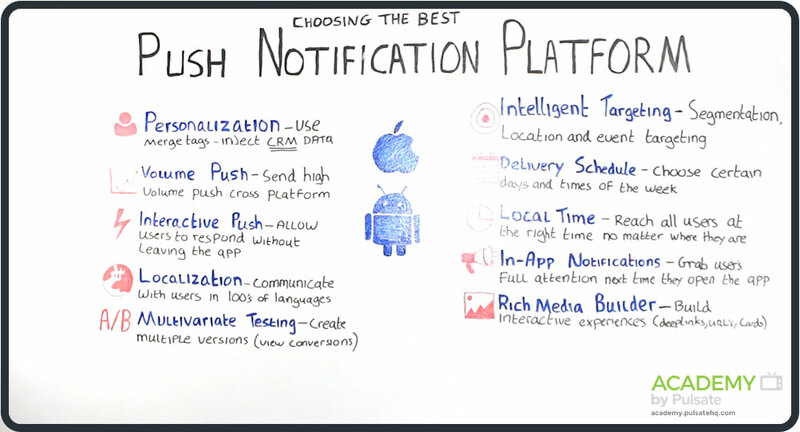 There are my tips today for selecting a push notification platform and provider, and the things that you need to know and should look for in a push notification service provider. Don’t compromise, select the best, and make sure you’re getting all of these tools that you’re going to need to take your app to the next level and supercharge your results.